Close to 70 percent of voters think Hillary Clinton and Donald Trump should accept the results of the presidential election, according to a poll conducted by POLITICO/Morning Consult. This may be quite a majority, but for various reasons, it's troubling that not all voters are willing to accept the election outcome. After all, under the democratic process, only one candidate will be voted into office. Around 30 percent of voters are either for challenging the election's results or are undecided about this issue, with 14 percent saying the losing candidate should challenge the winner. But almost half of all voters say it's "very or somewhat likely that there will be widespread voter fraud," even if they don't all think the election results should be contested. And that is the most concerning finding, considering how uncommon voter fraud really is. This comes in the wake of Trump publicly calling the election rigged on multiple occasions, as well as promising to "totally accept the results of this great and historic presidential election, if I win." As in, if Trump doesn't secure enough votes to be president, he's implying that he will not accept defeat. And according to the poll, only 49 percent of Trump-supporting participants believe he should concede victory if Hillary Clinton wins the vote. Another 24 percent of Trump backers believe he should challenge the results if he loses. Alternatively, only 7 percent of Hillary Clinton-supporting participants believe she should do the same if she loses. In terms of voter impersonation fraud, the likelihood of voters managing to cast a significant number of false votes is low. A comprehensive investigative study by Loyola Law School professor Justin Levitt found only 31 credible incidents out of a billion ballots cast — an incredibly small percentage. And no presidential election has ever been won by such a small margin. Still, 47 percent of voters polled by POLITICO believe that intimidation at the ballot box could constitute fraud during this election. Neither Clinton nor Trump has directly told supporters to intimidate voters, but some statements by Trump have caused some to fear that he is inciting voter intimidation. "Go down to certain areas and watch and study and make sure other people don't come in and vote five times," Trump told a Pennsylvania crowd. (Trump's claim that people might "vote five times" is unsupported by facts.) His campaign has also encouraged supporters to sign up and "volunteer to be a Trump Election Observer." If you sign up to be an election observer, according to NBC News, you get an email which reads,"We are going to do everything we are legally allowed to do to stop crooked Hillary from rigging this election. Someone from the campaign will be contacting you soon." Some Trump supporters have already signed up. "I'll look for... well, it's called racial profiling. Mexicans. Syrians. People who can't speak American," Steve Webb, a 61-year-old Trump supporter told The Boston Globe. "I'm going to go right up behind them. I'll do everything legally. I want to see if they are accountable. I'm not going to do anything illegal. I'm going to make them a little bit nervous." But some of Webb's actions may be illegal regardless of his intentions to legally monitor his racially-profiled candidates. 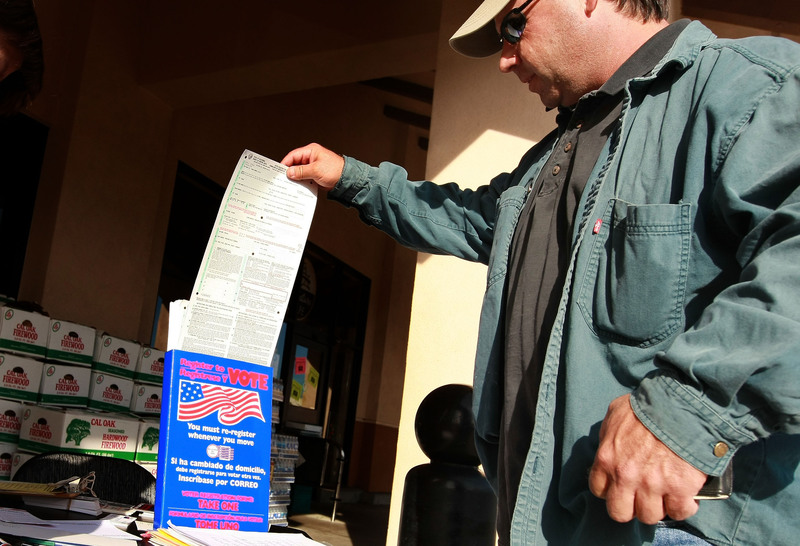 "If you have a group of people gathering in an organized way outside a polling place and they are making voters feel uncomfortable, that can quickly cross into illegal territory," election law expert Rick Hasen told TIME. Federal laws prohibit voter intimidation or suppression, and state laws protecting voting rights vary from state to state. The United States is built on a system of democracy, and to dispute the results of elections without substantial evidence of wrong-doing is undermining that system. Until the facts prove otherwise, Americans should refrain from blindly accepting Trump's claims of a rigged election. And rather than worrying about following other voters around on election day, people should focus on casting their own votes.